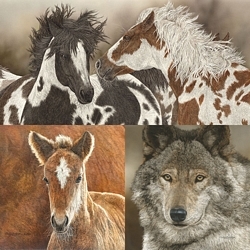 Click here to explore the hidden image keys in Judy Larson's fine art. for words. And, indeed, this wild horse country, on the border of Montana and Wyoming is both a spectacular and a challenging land. Crow and Shoshone once rode though this area on their way to hunt buffalo on the Plains. Here, on the south slope of East Pryor Mountain overlooking the Bighorn Basin of Wyoming, lies the Pryor Mountain Wild Horse Range, encompassing almost 47,000 acres devoted to the nation’s first wild horse refuge. Unique, wild mustangs of Spanish ancestry have occupied the many ridges and ravines of this rugged and mysterious country for, some say, close to a hundred years. Approximately 120 to 140 of these rare mustangs roam free, from the Pryor’s high meadows down to the juniper-covered foothills, from the desert-like badlands to the valley floor’s green fields. Mustangs, mule deer, elk, black bear and bighorn sheep all share the delights and hazards of living in this harsh and secluded environment. The Pryor Mountain mustangs are generally referred to as primitive-type horses. All as small, standing twelve to fourteen hands and some have the coats of dun and grulla generally regarded as the color of the primitive-type breed. Only the dun and grulla mustangs and occasionally a bay or chestnut are characterized by primitive markings - dorsal, zebra and with stripes, dark-rimmed ears and other unique markings. The Pryor Mountain mustangs, so characteristic of Spanish colonial horses, also possess a sloping croup, long tapering muscles, a deep body and convex head with fine crescent-shaped nostrils. Genetically unique, Pryor Mountain horses are historically and culturally important, worthy of preservation. Mustangs are not vanishing but the territory allotted to support them is. Remarkably fecund, mustangs simply do not have enough land to support their growing numbers. Despite inclement weather, poor roughage and semi-desert terrain, each year’s new foal crop can increase a herd up to twenty percent. To keep the numbers in check, twenty to forty animals are separated from the Pryor Mountain herd each March at the Bureau of Land Management’s (BLM) Britton Springs Corral.